This unit offers the versatility of working for new installations or for overlashing cable to existing plant. Has a 2 3/4" cable capacity. Cast aluminum shoe with a steel insert on the face provides longer wear life. 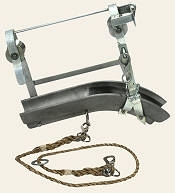 The shoe is suspended on steel straps from two strand rollers with safety lock preventing it from falling from the strand. All steel frame parts are plated for corrosion resistance.